On Anzac Day 1963, a six-strong New Zealand civilian surgical team arrived in Qui Nhon, South Vietnam as part of the Colombo Plan assistance programme. Their deployment – two years before New Zealand combat troops were sent – marked the beginning of this country’s involvement in the Vietnam War. 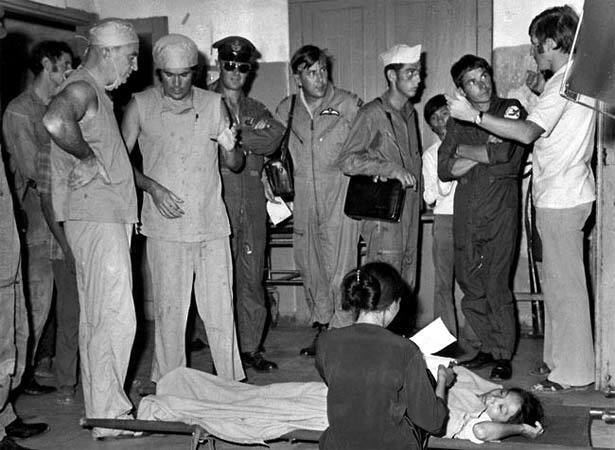 The team based at Qui Nhon, in central Binh Dinh province, treated civilian war and accident casualties from the surrounding area, and trained Vietnamese medics and nurses in all aspects of modern hospital medicine, including maternity, paediatrics and public health promotion. Dunedin surgeon Michael Shackleton – accompanied by his wife and five children – was the first team leader in Qui Nhon. Given the task of establishing a base for his staff, he performed admirably despite uncooperative local counterparts, inadequate facilities and limited New Zealand administrative support on the ground. By 1966, the team had grown to 14: three surgeons, a physician, an anaesthetist, an administrator, a laboratory technician, six nurses and a maintenance officer. It continued to operate until March 1975, when it was evacuated to Saigon (Ho Chi Minh City) a few days before Qui Nhon fell to North Vietnamese forces. The last team member, Dr Jack Enwright, left South Vietnam in late April 1975. In 1991, a coalition of 12 agencies, including Volunteer Service Abroad and the Red Cross, revived the relationship with Qui Nhon that had been forged by New Zealand medics and public health practitioners during the war. This collaboration continued until the government withdrew funding in 2002. Training continues to be sponsored by the New Zealand Viet Nam Health Trust, which was formed in 1997 after a reunion of New Zealanders who had taken part in the medical effort in Binh Dinh between 1963 and 1975. We have 3 biographies, 5 articles, related to New Zealand medics start work in South Vietnam.